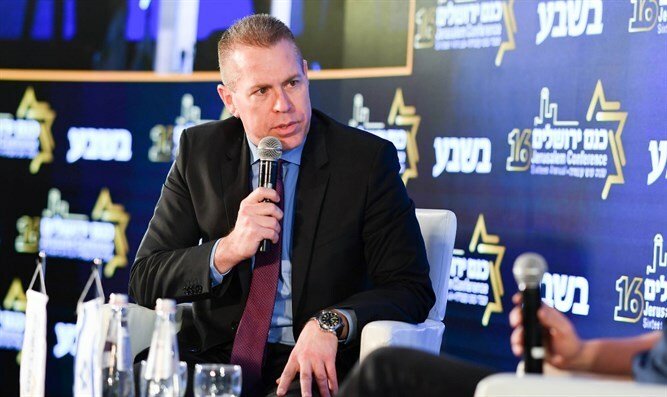 Public Security Minister Gilad Erdan warns that divisions among right-wing parties could enable formation of left-wing government. Public Security Minister Gilad Erdan (Likud) warned Monday that the divisions on the right and the multiplicity of smaller right-wing parties could enable the left to take power after this year’s election. Erdan also rejected Israel Resilience party chief Benny Gantz’s suggestions that the party is centrist, calling Gantz, a former IDF chief of staff, a “left-winger”. Erdan pointed to Gantz’s recent statement in support of the 2005 Gaza Disengagement – a statement which earned praise from Palestinian Authority chief Mahmoud Abbas. Recent polls show the right-wing and religious bloc losing as many as 17 seats-worth of votes in the April 9th elections to parties which fail to cross the 3.25% electoral threshold. The center-right Kulanu party, along with Yisrael Beytenu, have failed to cross the threshold in several polls this month. The haredi Shas party, too, has failed to clear the threshold in several polls. In addition, several smaller right-wing parties seem unlikely to clear the threshold unless they form a joint ticket together. Otzma Yehudit, Yahad, and the libertarian-leaning Zehut all are projected to receive between one to three percent of the vote in polls – enough to weaken larger right-wing parties but not enough to cross the threshold. The possibility of a collapse of the right-wing bloc in the election – even if the right wins a majority of votes, has led some to compare it to the elections for the 13th Knesset, held in June 1992. Despite winning a plurality of the vote, the right-wing and religious bloc won just 59 seats in the 120-member Knesset, due in part to the failure of the Tehiya, Geulat Yisrael, Torah VeHaaretz, and the New Liberal Party (a split faction of the Likud) to cross the threshold.